We've all seen similar headlines, covering research that promises to be the next big thing in treating cancer. Sometimes the research pans out, sometimes it doesn't. So why is this research any different? For one, it's a brand new target, one that was previously "undruggable," as the authors say (i.e. drugs haven't been able to successfully target it yet). Two, the compound used in the research is a new technology that could open up all sorts of avenues for drug discovery and development. Three, the research furthers the knowledge of a somewhat unknown signaling network.1 Fourth, the target is implicated in roughly half of T-cell acute lymphoblastic leukemia cases and a number of other cancers, so the numbers of patients that could benefit if this were to be developed into a therapy could be significant. Pharmaceuticals are typically one of two types - small molecules, which can easily enter cells, or biologics - proteins, antibodies, etc - that have a difficult time making it into cells. A number of cancer treatments are the latter type, working on the outside of the cell. For example, Avastin is an antibody that targets a growth factor which binds to a cell surface receptor. The consequent signaling cascade occurs inside the cell, but the antibody remains outside. A problem with this kind of therapy is if you impact a signaling cascade high up the chain, you will have all sorts of untoward downstream effects. Scientists would like to be able to get into the cells and target members of signaling cascades much further downstream, but some of the targets haven't been amenable to small molecules (which can penetrate cells). Targets that haven't been "druggable" in the past include transcription factors. There are 60 or so transcription factors that bind small molecules, one of the researchers said, but the vast majority don't and those have been completely undruggable. Transcription factors are proteins that bind to DNA, either alone or in a group (a "complex"), and tell the DNA whether it can transfer its genetic code to RNA (called transcription). TFs turn on (activate) or block (repress) the recruitment of an enzyme that transcribes specific DNA sequences, which then start more cascades that control cellular processes. They work deep in the cell, where big bulky biologics can't reach. So far, nobody has been able to get a biologic that targets TFs to work. Researchers have tried breaking up biologics into peptides and sent them into cells to try to modulate TFs, but the peptides weren't stable enough. Yet researchers at Harvard, Dana Farber, MIT and Brigham&Young's knew that if you attach peptides to a scaffold, they're more stable - propping them up, essentially, so they don't break apart. One of the researchers, James Bradner, had studied a protein called Notch (so named because the original discovery was in Drosophila, whose wings had a notched appearance). The gene encoding Notch "is often damaged, or mutated, in patients with a form of blood cancer, known as T-ALL or T-cell acute lymphoblastic leukemia," according to Science Daily. Abnormal NOTCH genes found in cancer patients remain in a state of constant activity, switched on all the time, which helps to drive the uncontrolled cell growth that fuels tumors. Similar abnormalities in Notch also underlie a variety of other cancers, including lung, ovarian, pancreatic and gastrointestinal cancers. What does the protein do? Well, that's a topic of considerable speculation, but there are some knowns. It is definitely involved in a number of cellular processes and impacts oncogenes like c-myc, and is active in a number of cancers besides leukemia such as lung, ovarian, pancreatic and gastrointestinal. How does it work? Again, the whole cascade hasn't been worked out, but there are knowns. You can see in this diagram that Notch binds to other components in the cell and forms a complex that can turn on gene expression. Notice the yellow alpha-helix, which fits nicely in the complex (top part of the diagram). You need all of these parts to activate gene expression. The Boston group created "stapled" peptides - they braced the peptides so they wouldn't fall apart inside the cell - in the shape of the alpha-helix part of the transcription complex. When the stapled peptide joins the complex, one of the other parts (MALM1) can't bind, and therefore gene expression can't occur. They group tested a number of these stapled peptides. 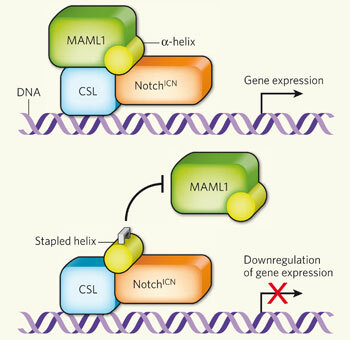 One of their test peptides, called SAHM1, not only entered the cell in a reasonable amount of time, but it also bound well to the Notch complex. SAHM1 also reduced the activity of genes in T-cell acute lymphoblastic leukemia cells (normally switched on by Notch1). That's all well and good in leukemia cells, but how would this stapled peptide work in a model organism? The researchers injected mice (who had progressive T-ALL) either once or twice daily with SAHM1 and compared them with untreated mice. Injection twice-daily caused "potent, Notch-specific anti-proliferative effects" in the cell cultures and the mice, the authors wrote in the Nature article. When researchers looked at the expression levels of genes across the genome, in both cells and mice treated with the peptide, they "observed markedly reduced expression of genes that are controlled directly and indirectly by Notch," Science Daily reported. Once-daily injections produced a lesser effect than twice-daily injections. As I mentioned above, this research is important on a number of levels - new drug target, new information on an important signaling cascade, new drug delivery system, lots of patients that could eventually benefit if this is developed as a drug. But this could impact other transcription factors, too - a lot of them assemble in a similar way to the Notch complex, so having a way to fit peptide shapes (like the helix) in to other complexes could open the door to targeting other diseases as well. This stapled peptide "seems to be the first example of a potent, direct acting inhibitor of any transcription factor that doesn't already bind a small molecule," a researcher said. 1 Mike has a really interesting article on how to discuss/frame systems biology in model organisms here.